It was over for KB before it started he came into the NFL thinking he was a superstar because of his rock star status at fsu natl champ winning catch ..he was at best a number 2 ..Panthers offence was consistently better without him . That being said some team will give him a shot..he's super slow for a wr and doesn't get separation if I was him I'd switch to tight end and eat linebackers but ego . She fits in with what they are looking for at NFL network...they want a variety of different things. Like the fantasy show is not run by football experts either..she has a different type of approach which is what they want. If they wanted to be super serious they wouldn't have michael irving and deion doing coverage . Rodgers is definetely arrogant anyone can see that..he's much more Kobe than dirk Nowitzki . At the same time though..the Packers have wasted nearly his entire career with archaic policy's like Thompson's free agent aversion and mcarthys in game blunders . They could have easily got Marshawn Lynch his college teamate from Buffalo which would have taken them to another level on offence etc ...the Patriots work because Belichick might be a huge jerk but his coaching is brilliant so it erases whatever flaws are in him and toms relationship. 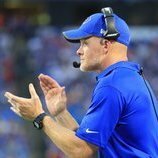 That wont make a significant difference unfortunately...the patriots offence is practically robotic its predicated on an entire roster of short shifty players who get open aslong as bradys internal clock is okay they will keep chugging along...they will just keep finding edelman/welker clones. they always appear to struggle early then they tighten up like a well oiled machine. DK just the video says can definitely be successful in the right system and with the right Quarterback. My comparison for him is Dez bryant but he is more explosive. Dez was never a Good route runner..but was able to be productive catching jump balls slants and deep passes but it takes a Seasoned qb to be able to get production out of those type of players often times they wont have much separation but will still be open given their catch radius and body position. Its why Dak struggled throwing him the ball and why his preferred option was beasley or witten...Romo was obviously more seasoned and more able to understand the nuances of passing. Theres always going to be a weakness on your defence and offense in the salary cap era..and there is always different ways of masking those weaknesses..this is prolly one of the weakest incarnations of the pats offence...gronk is past his prime...edelman is not getting younger and they have no outside threat...the point im saying i feel imo they could have done more..no ones gonna stop the pats offence but they could have done more to slow them down.. there are things you can do the reason why brady was getting the ball out so fast in the chargers game was the wrs were getting free releases...in the chiefs game brady had to hold the ball much longer because the chiefs pressed them at the line..their problem was not being able to cover the pats inside routes..and not having cohesive pressure packages. Half the battle of beating the patriots is mental the giants defence that beat them twice in the superbowl had weaknesses all over the place. There are still different ways to scheme around your weaknesses...that same broncos defence wade coached up got torched the year before when del rio was calling plays. the chargers have tons of talent on defence and especially on the d line a more creative mind could have come up with pressure packages and stunts that would disrupt the patriots timing based throws..the pats did exactly that to the chiefs they doubled hill and had their d line stunt and loop and create favorable matchups against the chiefs oline..the pats o line isn't the best in the entire league they can be pressured the bottom line is theres enough film out there that has shown what it takes to disrupt the pats offence...sitting back in zone will never beat them..if bradys able to just set up take his drop and have nothing around his feet all day hes gonna carve up your defence. 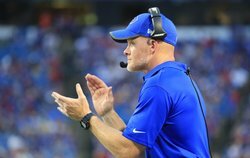 weve seen that same scenario play out for our very own bills..week 1 and 2 got absolutely demolished by the ravens and chargers where we sat back in our cover 3 shell and just played passively until mcdermott took over the play calling briefly and we started using much more blitz packages and pressure oriented schematics the rest of the year.